We have a completely transparent process which is designed to give our customers maximum exposure to the technology that we implement in their business. 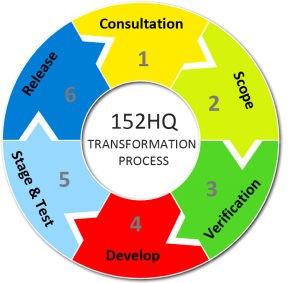 As a client of 152HQ, you will be able to see where we are taking your business, as it happens. We work alongside you to fully understand your business. We will provide a complete mock-up of the solution for you to approve before we go into development. This has proven as the best way to save money and time for all parties. Our 6 step process specialises in transferring businesses from the world of paper and taking them into the digital age.